Great sounds with versatile programming. 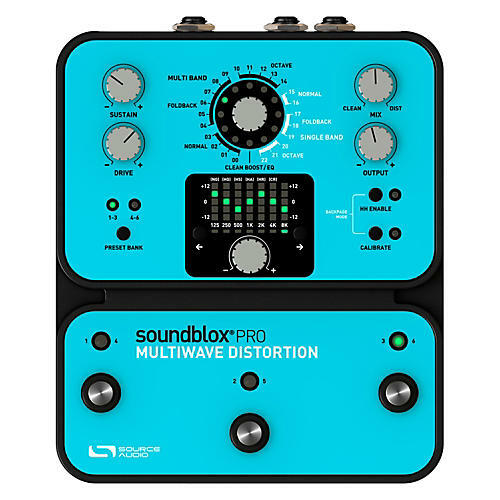 The Soundblox Pro Multi Wave distortion pedal offers 23 distinct and highly tweakable effect types ranging from the traditional to extremely unique and aggressive synth-like distortions. It features a 7-band graphic EQ, six programmable user presets, a MIDI input, and an expression pedal input which allows users to seamlessly morph from one preset to another. Flexibility, programmability and a bold sense of adventure make the Multiwave Pro a powerful tool for both studio and stage. The Multiwave Pro's effect types are divided in two categories: Multi Band and Single Band processing. Each processing category is then broken-down into three more subcategories: Normal, Foldback, and Octave. The onboard 7-band graphic equalizer with a plus or minus 12 dB adjustment range provides serious tone manipulation capabilities. Plus, customized tones can be saved in the six programmable user presets, available for speedy recall via three footswitches. Connect an expression pedal to the Multiwave Pro and gradually morph from one preset to the next, or leave the pedal in the middle of two presets and create a one-of-a-kind hybrid tone. Also, the Pro includes a MIDI input allowing external access to presets and parameters, and is Hot Hand ready for even more expressive possibilities. Order today and enjoy the smart design and great sounds of Soundblox processing. Diverse Sound Palette ” Featuring 23 varieties of our unique distortion algorithms with an added CLEAN BOOST + EQ mode. State-of-the-art DSP ” Our proprietary 56-bit Digital Signal Processor, the SA601, and crystal clear 24-bit converters. 7-Band Equalizer ” Ultra-precise 7-band equalizer for in-depth tone control saved per preset. Sound Morphing ” An expression input allows morphing of sounds between preset banks. MIDI Capable ” A MIDI input allows external access to presets and parameters. Motion Control ” All Soundblox and Soundblox Pro pedals are ˜Hot Hand Ready' and can be used with any Hot Hand motion sensor to extend the capabilities of the unit.